Welcome to the first issue of SKM for 1995 and although a little late to say, Happy New Year to all SKM readers. In this issue I am very, very pleased to feature two of the most popular and amazingly talented J.K.A. Instructors in the world. 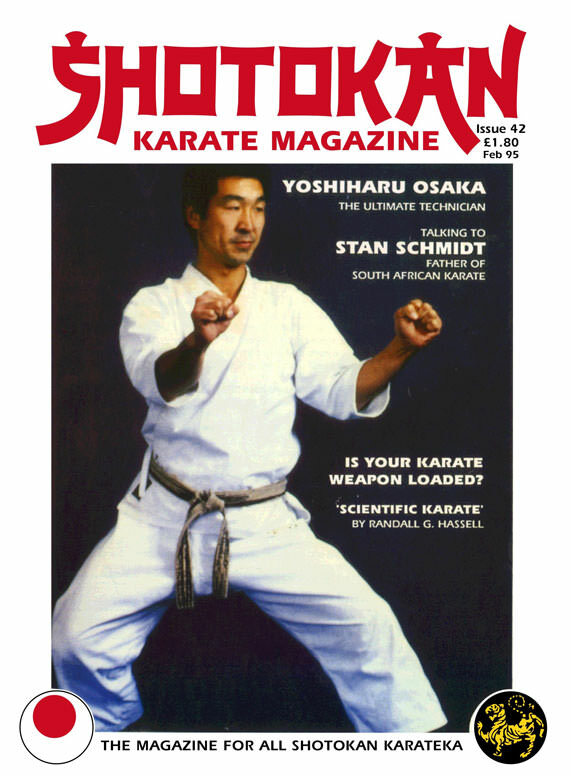 Sensei Stan Schmidt 7th Dan JKA is a karate legend and we have a brilliant and very lengthy interview with Stan, who has many interesting stories to tell and voices his opinion on a wide variety of topics. We have a profile on Sensei Yoshiharu Osaka 7th Dan, one of the most talented of all the J.K.A. Instructors. Read very carefully what Osaka Sensei has to say about technique and kata and what are the most important points. There are many 'Technical' points covered in this edition with many issues raised with regard to variations in technique. I have purposely included an excellent technical article by the famous Martial Arts author, Randall G. Hassell entitled 'Scientific Karate'. The reason being that we should never forget that karate is not a brute force, sluggers sport but a refined, technical and scientifically sound system of attack and defence. It is a method of producing maximum power in techniques without brute force. We need to constantly study the way power is supposed to be transmitted in karate techniques and this highly technical article (yet written in layman's terms) is ideal for both beginners - intermediate and advanced students (instructors) to focus on the three main ways of making power....SHIFTING as in stepping,e.g. (oie zuki) or sliding techniques (yori ashi), ROTATION as in reverse punch (gyaku zuki) or opposite rotation e.g. (uraken uchi) back fist strike etc. and VIBRATION as in close range techniques where there is no room for either stepping or rotation and you have to rely on focus and the stomach muscles. There seems to be a mis-conception that karate is just about getting as strong and fit as possible and throwing out technically poor punches and kicks and calling this karate. Of course there is nothing wrong with getting as strong and fit as possible. However, karate is an art and a science and the proof of this is the fact that many of the sixty-years plus karate masters are still unbelievably effective after all those years of hard training. The older they get and the more and more they rely on CORRECT TECHNIQUE and the skill that comes with it. 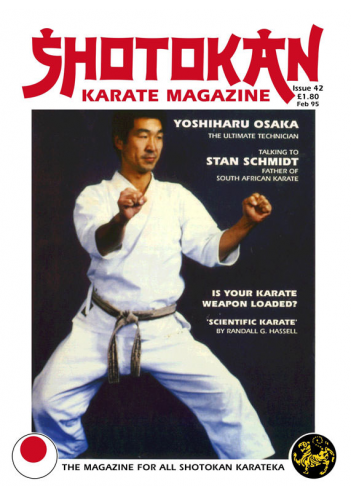 Another interesting technical point emerges in the article 'Is your Karate Weapon Loaded?' Read what American karateka Lee Scott has to say about the difference between, Relaxation - Tension and Contraction - Expansion!! There is much food for thought there and I know many black-belts will be discussing this topic over a beer (or two) after training. We have also another Historic piece as with the last few issues which also focuses on a 'technical' point regarding Back-stance (kokutsu dachi). This was written in 1992 to celebrate 70 years since Gichin Funakoshi first introduced karate into mainland Japan. The author is Motonobu Hironishi who trained with both Gichin and Yoshitaka Funakoshi. Good luck with your training for 1995 (Editor). YOSHIHARU OSAKA 7th Dan JKA 'THE ULTIMATE TECHNICIAN' By John Cheetham. In Master Nishiyama's presentation Video tape of Traditional Karate to the I.O.C. (International Olympic Committee) in 1986, after the explanations and criteria for judging a KATA competition were detailed, a short clip of film was shown from the first World (all styles) Championships in Los Angeles in 1975. Yoshiharu Osaka was performing UNSU in the final elimination. His kata was described as, "An outstanding example of technique, quality, continuity, tempo and skill." His demonstration earned him the Championship. Ask any top Shotokan Instructor who their favourite Kata performer is, and you can guarantee OSAKA's name will be the first mentioned. His mastery of Kata and basic technique are now almost legendary. 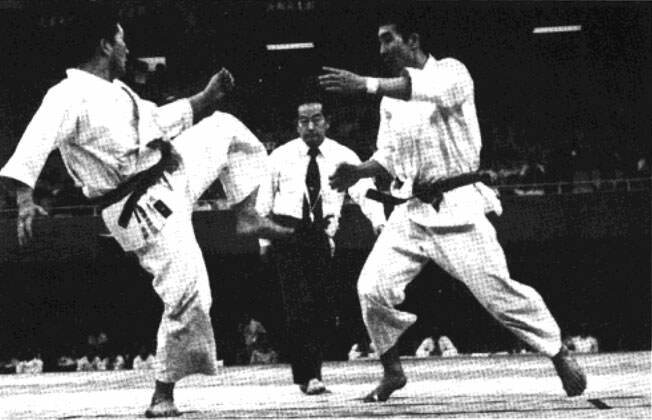 Often overlooked however, is the fact that Osaka Sensei was also a great fighter who won the 19th annual JKA Championships in 1976. He used lightning fast, piston like punches with superb timing and powerful uraken (back-fist strikes). Real back-fist strikes, with full power, not the sought you see in competition these days which resemble a back hand 'flick' that would hardly disturb a fly on the wall. Osaka's fighting style was mostly - attacking! He showed great fighting spirit even against much bigger opponents like the huge Mori, one of his contemporaries. However, it has to be said that it is KATA and his perfect technique that Osaka is famous for. His first major win in Kata competition was in 1969 in the All Japan Karate Championship, JKA (Individual Student Division). He later went on to hold the record, winning the JKA Kata Championship from 1977 and never losing until 1984. 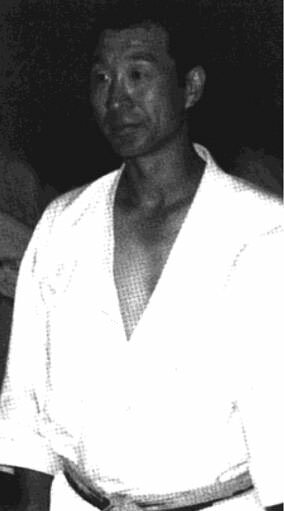 Sensei Osaka was born in Nagasaki, which is in Kyushu, in 1948 and started karate in 1963. 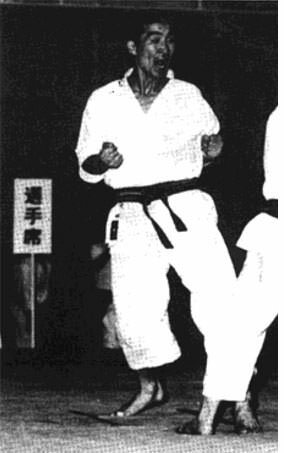 His serious karate training began when he enrolled at the notorious Takushoku university in 1966. After four gruelling years training at Takushoku under the watchful eye of Sensei Tsuyama, who saw the tremendous potential of this young student, Osaka decided to make karate his career and was recommended to attend the famous J.K.A. Instructors course programme by Sensei Tsuyama. Osaka Sensei graduated from Takushoku and went straight into the J.K.A. in 1970. The late Chief Instructor of the J.K.A., Master Nakayama, took a personal interest in Osaka's development and it is well known that Osaka was one of his favourites. Not since the heady days of the era of KANAZAWA, ENOEDA, SHIRAI and MIKAMI, etc...had there been anyone quite as brilliant as the young Yoshiharu Osaka. He was obviously a very special apprentice instructor and was groomed accordingly. Osaka Sensei accompanied Master Nakayama all over the world on teaching trips and became very close to the late Master. 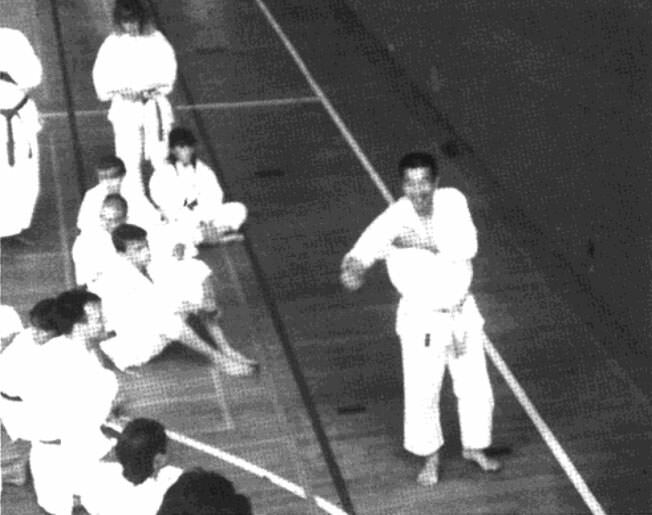 When Master Nakayama taught on various courses he would use Osaka as the role model, showing how techniques should be performed. Nakayama said that few have come close to such perfect technique as Osaka. 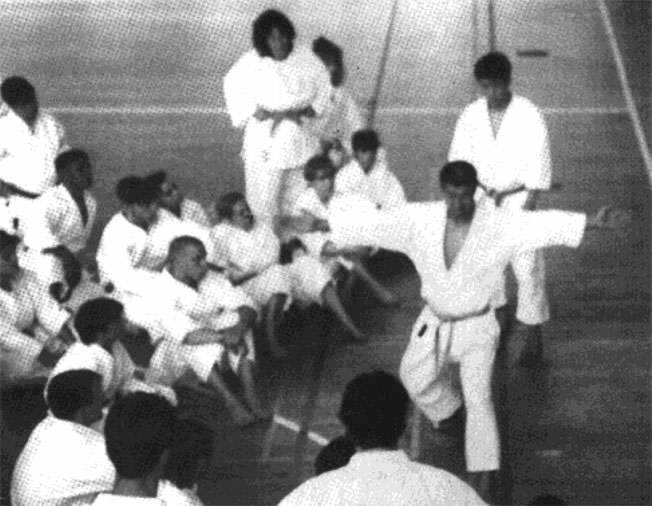 Yoshiharu Osaka Sensei demonstrates kata - Hian Godan at 1994 Crystal Palace course, closely watched by Sensei Ohta (Photo by L.Burden). These days as a very senior figure at the J.K.A. Honbu dojo in Tokyo, Osaka Sensei, 7th Dan, teaches there on a regular basis as well as travelling to many different countries to teach his perfect style of JKA Shotokan. There is nothing flash about Osaka's karate. He believes in simple, strong, fast, correct techniques for maximum effect. I've heard it said that Osaka Sensei is often very amused and also 'bemused' by the questions asked by foreign students, who always seem to want complex answers. For instance Osaka Sensei was asked by a Western student, "Where should the fist be positioned in kage zuki (hook punch) as in Tekki Shodan. Should it be in line with the side of the body?" Osaka was very puzzled by this question and really could not get the point the student was trying to make. Osaka put out his arm in a basic straight punch (choku zuki) position and then simply bent his elbow inward 90Degrees and said, "Kage zuki." 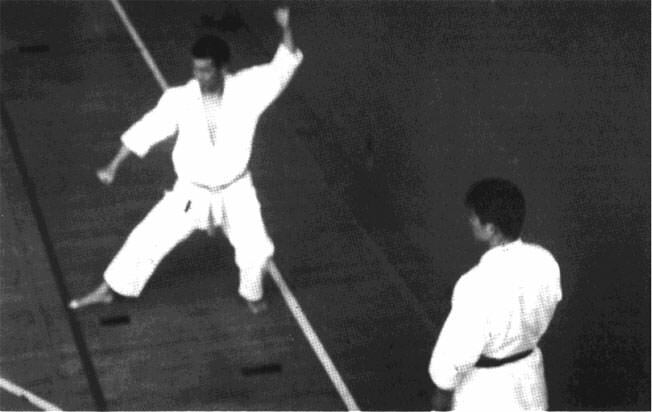 Another time in America a student asked Osaka at what angle should the front leg be when in a basic forward stance (zenkutsu dachi). "Should the front knee be pushed outwards or what?" Osaka was again confused by the fact that westerners always look for the hardest route. Osaka told him to stand up straight, feet shoulder width apart and both feet pointing forwards, then 'simply' bend the knees until level with the toes. Osaka said that this is the 'natural' angle for the front leg in zenkutsu dachi, it's just a 'natural' knee bend, so that the bottom half of the leg from the knee down is slightly angled in. (The angle of the side of the leg not the front - shin). Osaka has been taught so correctly that these types of questions seem strange to him. When he teaches, whether in Japan or abroad, the emphasises is on correct basic form for techniques. Osaka has said that Western students develop very strong upper-bodies and fast, high kicking techniques but the problem he sees is that they don't connect the lower body to the upper body to make maximum karate power. Many times he will spend a whole lesson on 'stance work' to try and correct this error. He has said that it is stances and hips that he sees as the biggest problem with most Western students and how to make the lower body connect properly with the torso - via the hips. The 2nd I.A.K.F. Tournament 1977, Tokyo. When British karateka Dave Hooper (a student who trained with of Osaka for many years in Japan) was translating for him on a course in Europe some years ago, Osaka turned to Dave and said in Japanese, "Why can't they do back stance?" This was with regard to a class of some two hundred black-belts! Osaka, like many other Japanese Sensei's believe that we (westerners) don't do enough work on basic stances which are the foundation for karate techniques. So that the power is only athletic power which will deteriorate with age. He has said, "With regard to technique the natural body instinct slows down with age. This slowing down physically is a natural process but with regular training, using correct technique, regress can be held back for a considerable time". "This is a difficult question. European standards are progressing but there is a gap, there are various points that I notice. For instance the correct use of the hips in the interim movement and the finished movement from one stance to another. It is not only the finished position that is important, the transference from one stance to another with correct co-ordination is essential. The value of basics has to be understood or this gap will never close." Osaka Sensei went on to say........ "Important also is the atmosphere between student and teacher. Without the proper climate, plants cannot grow. It is the same with karate. Without this feeling, in-depth knowledge never passes between them." Kenny Taylor later asked Osaka....."Some people say techniques are changing, have you noticed this?" Osaka Sensei replied..... "Techniques have not changed from when I started, developed, but not changed. Sometimes they are wrongly taught or adapted because of some instructors' inability to make correct technique but the answer to your question is, NO! Techniques have not changed. Don't make mistakes in Kihon. Practice every day, this is no secret and you will improve." In his own personal training Osaka Sensei does not use weights or equipment. He does press-ups, sit-ups and various leg exercises e.g. standing on one leg then doing single leg squats etc, (you need good knees for that one). He does lots of stretching and daily kihon (basics) plus kata and makiwara training. He also teaches and trains on the daily JKA instructors class. "The first and second time I tried Kata competition I did just that, I tried without thinking, but in my heart I felt that there was much more. More 'feeling' left, something to spare. Then the third and fourth time after more training and experience I changed my mind and didn't just go through the motions. Even immersed in the kata I could see the audience and even see them enjoy the performance. When you are up performing Kata you must be like the main actor in a film playing a part and give your best possible performance, from the heart. From the very beginning of the kata, from the bow, I change my character, I am no longer me, until the end, then I am my own character again. Most important is a solid stance throughout the kata, making solid contact with the ground. You should feel as though when you take a step, whichever way, or whenever you move that you are taking the floor with you!" It's hard to say which is Osaka's favourite kata, although it has been said that he favours Sochin, he performs them all so well. On the JKA kata series of videos (Hisha Trading) Sensei Osaka demonstrates all the five Heian kata - Tekki Shodan, Bassai Dai and Hangetsu. You will be hard pressed to see these kata performed any better. For me personally, watching his interpretation and performance of any kata are incredible examples of how kata should be. Osaka Sensei is certainly my favourite where Kata is concerned, without a doubt.